About 10 days after the review was published, critics began raising complaints about MacLean's scholarship, ranging from charges she had misquoted some of those she cited to deeper questions about how she interpreted the history. Jonathan H. Adler has been keeping a running update of the criticisms (and praise) at The Volokh Conspiracy, a Washington Post opinion blog that calls its writers "generally libertarian, conservative, centrist, or some mixture of these, though we don't toe any party line, and sometimes disagree even with each other." While many of the critics of the book are libertarians, criticism has also come from some in the center and on the left. As the controversy over the book blossomed, a handful of NPR readers wrote to object to NPR's review. They raised three points: How could NPR praise a book whose scholarship had been so challenged? Why was the review assigned to a novelist, Genevieve Valentine, and not a historian? And why hasn't NPR followed up with a news story on the controversy? First, some context. NPR has made a push in the past year to review or interview the authors of all major nonfiction books that are published, and as close to publication date as possible. It's a huge exercise in coordination that involves NPR's newsmagazines, Here and Now, shows NPR distributes (including Fresh Air and 1A) and the online news operation — in the first week of September alone, more than 40 nonfiction books are coming out. Other major news organizations treat book reviews more selectively; The New York Times, for example, has yet to review or even mention Democracy in Chains, while the Washington Post has run more than a dozen mostly opinion pieces about it, but no review. 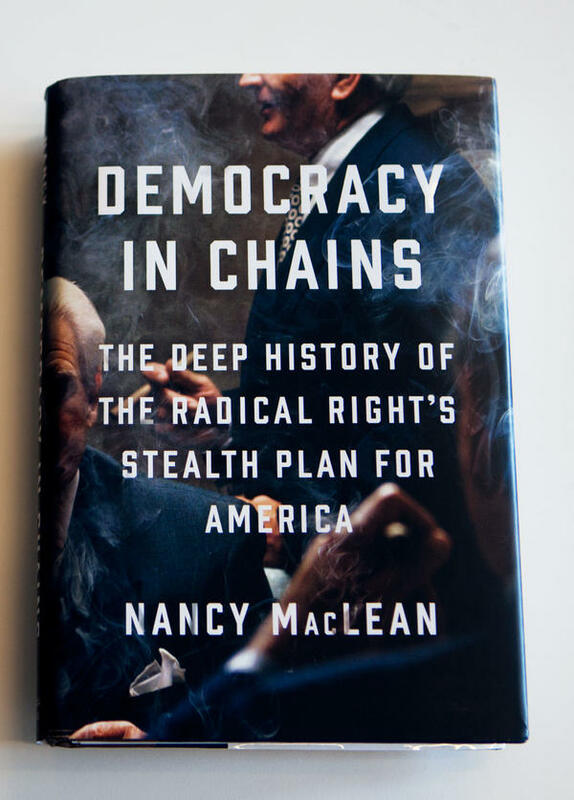 Thus, NPR's Democracy in Chains review came out just five days after the book was published. As I told two of those who emailed, I can't find fault with Valentine's review; she was asked to give her opinion and the questions about the book were raised after her review came out. But the choice of reviewer and whether a follow-up is due are interesting questions for the newsroom. The books editors turn frequently to Valentine to review a wide range of books, many of them nonfiction. Ellen Silva, the supervising senior editor overseeing NPR's books, arts and culture coverage, said the editors believe a novelist can bring insights into nonfiction books as well as fiction, and called Valentine "a valued critic at NPR books who is a master of the quick turnaround." Petra Mayer, an NPR books editor who helps coordinate and assign reviews, expanded on the insights a novelist can bring to a nonfiction review: "A novelist can tell you whether a book is well-written, well-structured, well-edited — are the characters compelling? Does it tell a coherent story? Does it move the reader? Those are all things that are just as applicable to nonfiction as fiction, and are all things it's important for our readers to know about a book they may spend time or money on. Ultimately, her critical opinion was that she found the book convincing — and that's what we want from a critic." That said, some reviews of nonfiction books are assigned to subject-matter experts, who in theory at least bring a deep understanding of the relevant background. For example, recent reviews of a couple of important nonfiction books — Stanton, a biography of President Lincoln's secretary of war, and Arizona Sen. Jeff Flake's Conscience of a Conservative: A Rejection of Destructive Politics and a Return to Principle — were assigned to NPR staff members with expertise in their subjects. In this case, author MacLean is a respected scholar, so the editors should not necessarily have anticipated the controversy that would arise over Democracy in Chains. Moreover, they also asked the editors who oversee the Washington desk to vet the review; those editors raised no questions about the content. Still, I think Baddorf has a point. As I said earlier, I do not have a philosophical problem with novelists reviewing history books. But given its provocative argument, this book in particular was almost certain to stimulate a good deal of civic debate. An expert in the topic probably would have been better situated to judge MacLean's work. Assigning a different reviewer still might not have changed the situation NPR now finds itself in, however, since it has not acknowledged the questions raised in the weeks since the book was reviewed with praise. Michael Hartwell, of Leominster, Mass., argued NPR should cover the allegations being made about MacLean's scholarship. I think he has a point, as well. MacLean has strongly defended her work, on Facebook, and in an email interview with The Chronicle Review, a publication of the respected Chronicle of Higher Education. That publication also has a good piece about the controversy, which, it says, "has played out with unusual intensity." As MacLean says in the interview, "The modus operandi of today's right wing goes well beyond normal book reviewing and customary academic debate." Some of the nastier commentary about her book certainly falls into that category; that commentary is not necessarily NPR-newsworthy (although I'm sure it's unpleasant for MacLean). But the debate over the scholarship is. NPR should consider assigning another piece delving into the criticisms, or, at least, append a note to the original review acknowledging the scholarship questions that were raised after the review appeared. Silva told me the editors indeed plan to add an editor's note to the piece.